Welcome to the role of e-learning facilitator! Facilitators are essential partners in ensuring student success in online courses. The NCVPS teacher, lab facilitator, e-learning advisor (ELA), and parent form a core team that can guide students to successful completion of their online courses. In all of these settings, the NCVPS teacher will provide all of the instruction for the courses. NCVPS courses include interactive learning objects, videos, audio recordings, and text readings that keep students engaged. Students typically do not have live contact with their NCVPS teachers, but teachers are available through email and messaging features in the course. Students can also talk to their teacher by phone or in our live classroom when they arrange it in advance or during teacher office hours. Students can also receive live help through our peer tutoring centering. Nevertheless, the more support students have at the school or in the home, the more successful they will be. That’s what makes the role of facilitator so important. This guide is designed to provide an understanding of the basic processes and procedures that successful online facilitators use to support students. We reached out to North Carolina public schools and our partner schools in the Virtual Schools Leadership Alliance to pull together the most fundamental elements of facilitating online learning. This guide is specifically designed to help the lab facilitator who is not the school’s(eLA) and who is leading a lab with students who are taking NCVPS courses. Your lab may also have students who are taking online classes with approved outside vendors or your district’s own online courses. This guide will help with those students, too. Please take this guide and adapt it into your own. What works well in one district may not work well in another. What works well in one home may not be suitable in another. So tear this guide apart and put your stamp on it. We hope you find this guide helpful. We also want to thank you for your dedication. You are in a great role to improve student performance. That is a great thing! Thanks again for your dedication and hard work! Facilitators function as a guide for students as they take online classes. They help students stay engaged and stay focused. They troubleshoot hardware and software problems. They know when to escalate problems to the technology department. Facilitators direct students to their online teacher when they have questions about their course work. Most importantly, the facilitator acts as the liaison between the student and the online teacher . The NCVPS teacher will contact the facilitator when a student is not logging in or not performing well. The facilitator will also make the NCVPS teacher aware of student concerns, issues, and problems. The facilitator also provides a live, personal connection for the students. Great facilitators work with students every day, supporting their learning efforts, and building trust as a valued educator with the students. Developing a supportive, caring relationship with lab students is one of the most actions that a facilitator can take. North Carolina schools with successful e-learning labs report similar lab preparation procedures. Take note of the following and tailor them to fit your school’s specific needs, capabilities, and requirements. Set up laptops and other equipment. Establish and maintain inviting classroom environment (bulletin boards, posters, etc.). Ensure all equipment is in good working order (laptops, microphones, headsets, cameras, etc.). Establish communications with district or school technology departments. Create a lab orientation for your students. This orientation would cover your lab essentials like rules, procedures, expectations, explanation of lab grades (if used). Prepare digital and physical folders for each student and maintain documentation including items like signed student contracts, sample assignments, grades, and communications between the student and teacher. In addition to preparing the lab and learning environment, there are a number of steps that the facilitator can take to prepare for that first day of NCVPS classes. These steps may also take place on the first day of class. Often schools have access to their students a few days before NCVPS classes begin. This is a great time to prepare students for the start of their online classes. email NCVPS teachers directly. You can find NCVPS teacher contact information in an enrollment report. Add your contact information in the NCVPS Registration System. Click on the “My Info” tab. In your contact information in the facilitator’s section. If you are also the ELA, enter your contact information there. NCVPS teachers will not have the correct email address to contact students. It is essential that our teachers have this. It helps ensure the success of your students. Students will not receive their forum updates. Student who forget their password, can’t use the password reset function on the Canvas login. Ask your students not to change their passwords without letting you know. This has caused problems for facilitators when they want to access students’ gradebooks only to discover the students’ logins do not work because the password has been changed. Student Checklist - We have a checklist for students, too. Please add your expectations to the student checklist! Characteristics of a Successful Online Learner - Share with lab students the characteristics of successful online learners. You can include that list in your lab guide. ELA Checklist - We have a checklist for ELAs, too! If you are filling both roles, you will want to see this checklist as well. Many of the responsibilities will overlap, but the ELA role deals more directly with registering, grade reporting, and transcripts. Online Platform - Check to see if your students are in Blackboard, Moodle, or Canvas courses. We host courses in all three platforms. Students and facilitators can see which platform their courses are in on our main login page. Scroll down to the list of courses. Tech Requirements - Make sure student computers meet our tech requirements. Students will not be successful in their online course without their computer meeting these technical requirements, using the right internet browsers, and having the proper plugins. There’s not usually a cost with any of the basic internet plugins and updates (like Firefox, Adobe PDF, Java, etc.). If students continue their work at home, be sure that their home computers meet these requirements, too. Orientations - Have your students go through the Canvas orientation before classes begin. Do this if you have access to students before NCVPS classes begin. Otherwise, they will go through an orientation in their course’s first unit. It’s a good practice for facilitators to be familiar with both Canvas, too. The better you understand the basic features and navigation of the platforms, the easier it will be to assist students. Confirm Enrollment - Be sure to check your enrollment report to confirm that your students are enrolled in the course and not waitlisted. If students are waitlisted, they may get into the course if new sections are opened OR if other students enrolled in the course drop from the course. No students will move off the waitlist after the 10th day of a course. NCVPS Website - Visit the NCVPS website to find valuable information for students, schools, and parents. Contact the Virtual Support Center for help when you need it. Click on "Open a New Ticket." Be sure to describe your question or problem with detail. Your ticket will be resolved by a Support Center technician or escalated to the appropriate staff member. Textbooks and Supplies - Be sure that the school has ordered the necessary textbooks and materials for the students’ NCVPS courses. NCVPS only has textbooks for AP courses. A number of science courses require lab materials. The world language courses require microphones. All computers should have headsets or earbuds. Create an inventory to keep track of the books previously ordered to reissue to current and future students. For science labs, you may need to solicit the assistance of a science teacher who can inventory the lab materials and equipment needed and facilitate students for designated labs. Much of the lab material can be found in an ordinary kitchen. URL List - The district technology department should unblock the URLs (websites) that are linked in our courses. You should confirm that this has been done, or students might be blocked from learning content in their courses. See our URL list for courses. Check the "Status" column on the far right of the spreadsheet to see if students are "enrolled" or "waitlisted." Students may move off the waitlist through Day 10 of the course. If you see any students who are enrolled who you know will not be taking the course, then please drop those students right away. This will help other students move off the waitlist. The day is here. NCVPS teachers will provide all the instruction to students. The online courses are filled with interactive lessons, videos, and text readings. The Virtual Support Center will help students technology questions within the course. The lab facilitator, though, can still take important steps on this day to foster a successful learning environment for students. In our conversations with school lab facilitators, we have compiled a detailed list of tips and suggestions to support individual students or groups of students in your lab setting. Course Details - Provide each student with the details for his or her course, including the course name, NCVP’s teacher name, web address to login, and login information. Course Navigation - Have students learn how to navigate the course. Encourage them to explore. Find the syllabus, gradebook, teacher information, and announcements. Course Instructions - Encourage students to carefully read instructions and contact the teacher if they have any questions. Individualized Support - Meet with student and ask what they need to be successful. Gather individualized information to help personalize the student’s support. Class Guidelines - Establish classroom procedures and guidelines with students at the beginning of each semester. Establish a Routine - Help students establish a routine for checking their course syllabi, calendars, course requirements, grade expectations, assignments. Some schools have students do this in a Google doc that they share with their facilitators. Group Emails - Create group emails for teachers and establish contact with them. Teacher contact information will be in the enrollment report. As soon as a teacher is identified for a section, you will see that in the system. Student Access - Ensure students can log in and access their courses. If students are having login difficulty, contact the NCVPS Virtual Support Center. Fill out the online ticket for a quick response. IEP/504 Plans - If the student has an IEP or 504 plan, be sure to communicate the modifications to the NCVPS teacher. NCVPS will be able to meet most of the modifications, but some may have to be met by the school (i.e. read aloud modifications.) The EC specialist or the ELA may make this communication, too. Make contact with the parents and students who have not logged in. Determine the next steps for them. If you confirm that the student is not going to take the course, please drop them from the course in the registration system. This will help other students move off the waitlist, and that student's enrollment will not count in your district's allotment totals if the school drops them on or before Day 10. Day 7 Status Report - This report will also be posted in the registration system. Students who have not logged in by Day 7 and submitted their first assignment will be placed on this report. Similar to the Day 3 report, facilitators should determine the next steps for students who have not logged in yet. If you confirm that the student is not going to take the course, please drop them from the course in the registration system. Schools may continue to drop through Day 10. Remember that any student not dropped by Day 10 will receive a grade for the course, and that enrollment will count in the district’s allotment totals. Last Day to Drop - The tenth day of class is the last day for a student to drop a course without penalty. Remember that the teacher cannot drop the student. The ELA must drop the student in the registration system. Last Day to Add - The tenth day of class is also the last day to add students into courses. Please be aware that students who enroll late are expected to make up all of the work that they missed. Late additions will typically need extra support from the facilitator to catch up. Greet students as they come in. Most online students do not have a facilitator. Yours are lucky enough to have one! Go ahead and personalize the lab for them. Remind students of successful habits. Have a daily goal (like completing one module or one assignment). Save copies of work to a local drive. If something doesn’t submit properly in Blackboard or Moodle, it’s very handy to have a backup. After students have time to get started, do a lab walk to ensure that all students are logged in and working. Make sure students maintain their computers, other hardware, and their workspace. Monitor students throughout class time. Computer monitoring software makes this much easier. You might check with your technology department if you don’t have monitoring software installed in the lab. Contact local technology help center when hardware and software issues arise. Contact NCVPS Virtual Support Center when NCVPS program issues arise. Check for marking period grades, report cards, and mastery charts. Serve as a student advocate to provide directions and support that will ensure student success in the online environment. Help students download or acquire appropriate software as required by the course. Post important dates on a bulletin board within in the lab: last day to drop, progress reports, grade reports, end of term, etc. Invite teachers to your lab. You have a lot of experts in your building. They can often give short tutoring sessions or answer questions on the spot in their fields of study. Read and understand course syllabus. Use a calendar to record due dates for assignments and tests. Determine if any material needs to be printed out. Communicate appropriately with their NCVPS teacher. Navigate online Moodle or Blackboard or possibly both, depending on what classes a student has. Monitor their gradebook. Progress reports, report cards, and final grades should never be a surprise to students. Monitor each student’s grades and assignment completions on a daily basis by having students pull up grades in their gradebook. Let the appropriate people on your communications team know when a student is underperforming or failing. Monitor student behavior. Report issues to appropriate school personnel. Assign a lab grade. Yes, schools can assign lab grades for NCVPS students. NCVPS teachers cannot make those grades part of the NCVPS gradebook, but schools can average in lab grades with the grades that teachers report. This is similar to how schools average in EOC and CTE scores. This practice often helps maintain an orderly, successful lab where students stay on task. Labs are a great place to teach and foster essential soft skills: Strong Work Ethic, Positive Attitude, Communication Skills, Time Management, Problem Solving Skills, Self-Confidence, Ability to Accept and Learn from Criticism, Flexibility/Adaptability, Working Under Pressure. All the things that make students successful in their course, in their future career, and in life. Proctor tests and quizzes if the NCVPS teacher asks for that. Hold conferences with students and parents as needed. Serve as liaison between students/parents/school/online providers in dealing with course and teacher concerns. Ensure that parents are kept informed of student academic performance and attendance according to school procedures. Contact teacher on behalf of students who are absent, sick, on a field trip, or struggling with coursework. Use computer monitoring software if available. Transfer students and late adds - if a student begins a course late or enrolls as a transfer student, help establish communication between the student and his or her NCVPS teacher. Maintain contact with Special Services regarding IEP and 504 plans for online students. Attend conferences or meetings as requested. Ensure special needs students receive modifications needed to ensure student success. If you have students who are low-performing, under-performing, or at-risk for any reason, NCVPS has a number of intervention strategies for districts and school to follow. Check for progress reports and report cards in the registration system. Updates are made every two weeks. You may contact teachers directly between updates to check on student progress. Have students contact their teacher during their office hours for live help. Try to establish a recurring time for the student to meet with her or her teacher (in Blackboard Collaborate or by phone) for one-on-one tutoring. Peer Tutoring - Peer Tutors provides tutoring in specific content areas. Virtual Buddy - Virtual Buddies are select student volunteers who have agreed to work with NCVPS students who need more than content help in their online classes. Quick Questions - Services are available to all students via Blackboard IM at the start of the semester. For the first four weeks, this is the primary work we provide to ALL NCVPS students. Establish peer tutoring with other successful NCVPS students at your school (if available). Have EC students meet with the school's EC specialist. Have students attend your school's review sessions (if available). Have students attend your school's tutoring session (if available). If the student is taking the course off campus, consider moving the student to a lab setting, especially if the student is not logging into the course. If you have students in EOC or CTE courses, be sure that they take part in our EOC Reviews that are in each EOC course. Have them contact their teachers for more information. Establish weekly or bi-weekly contact with teacher of any at-risk students. 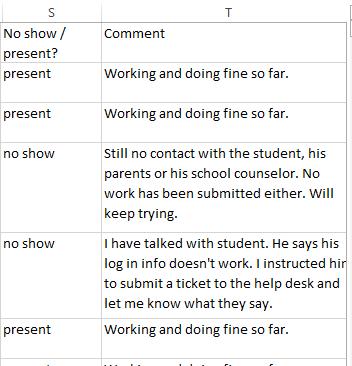 Have parents log in with the students at home and monitor their work. Parents can communicate with the teacher , too. Teachers help with course questions and course content. The Virtual Support Center helps with technology issues in the course and login issues. The school ELAs help students with enrolling and withdrawing from a course and with transcript and report card questions about their NCVPS classes. Last day of courses. Students will not have access to their courses after this date. The grade submitted to you for students in EOC and CTE courses will be 75% of the student’s final grade. You will need to factor in the remaining 25% from the student’s EOC/CTE score. Administer EOC and CTE exams. Your school will administer all EOC and CET exams. Be sure to use the NCVPS course codes for those exams. Check the Reports section in the registration system for grades. See the calendar for exact date that final grades will be posted. Graduating Seniors - Facilitators or ELAs may contact teachers early for grades for graduating seniors. Teachers can only accommodate this request for graduating seniors. Be active in their course daily. Post teaching and encouraging announcements daily. Grade assignments daily and provide feedback. Update Exceptional Children’s document as needed. Respond to all questions/comments within 24 hours or sooner from ALL stakeholders i.e. students, parents/guardians, ELAs. Make synchronous contact with all students. Be prepared each week by reviewing content. Contact ELAs and parents/guardians regarding failing students. Complete all required progress reports and/or grade reports as directed. Adhere to the NCVPS grading guidelines. Follow this link to see the full list of expectations for our teachers. The E-learning Advisor - In most schools, the lab facilitator is not the e-learning advisor. That’s not the case at all schools, however. The two positions together are the most essential in driving a successful e-learning program and central to the communication plan. Share online opportunities with parents. Parents might not be aware of NCVPS, and they might want or need for their child to take an online course. Notify parents when their child is enrolled in an online course. Give parents NCVPS teacher contact information.